November 19, 2018 (Last Updated: April 7, 2019) - As an Amazon Associate I earn from qualifying purchases. Cream, sausage, butter, and knoephla dumplings make up this luxuriously guilty pleasure. This Sauerkraut and Sausage Knoephla Skillet Dish is some serious German comfort food and a great single skillet dish for a weekday night or when you want something a bit special. 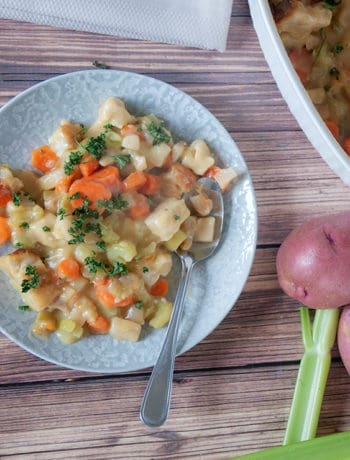 In our exploration of Knoephla soup, I found a German Knoephla recipe that I have fallen in love with. 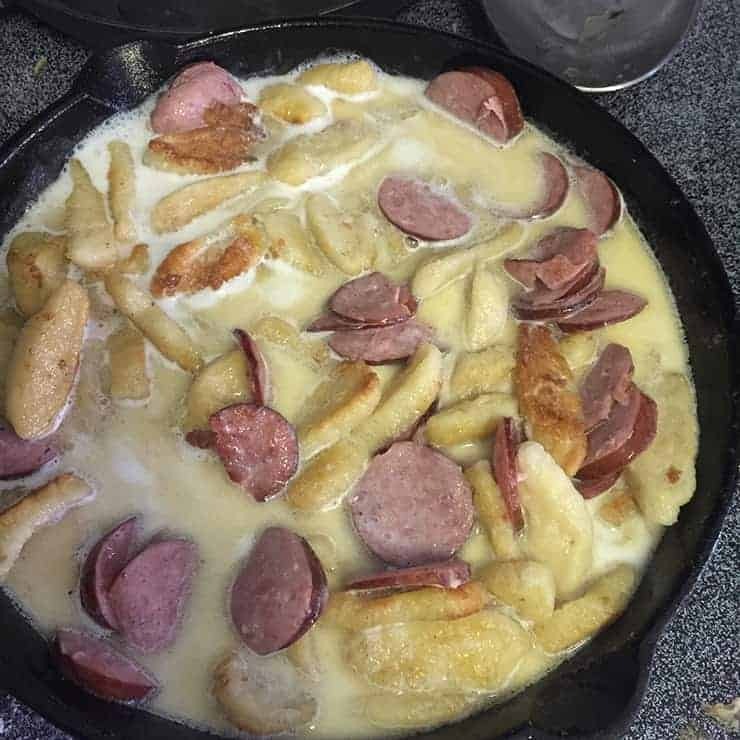 It is not a soup, but a skillet dish that has knoephla dumplings, sauerkraut, and sausage. 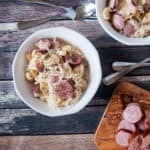 This Knoephla Sauerkraut and Sausage recipe still has the creamy, buttery feel of the soup I make, but adds some other excellent German flavors. This is an easy-to-make meal and if you already love sauerkraut, this skillet dinner is totally worth a try. 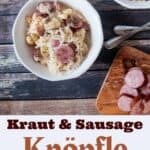 Enjoy our Knoephla Sauerkraut and Sausage recipe. Growing up, I only knew knoephla as a soup recipe. 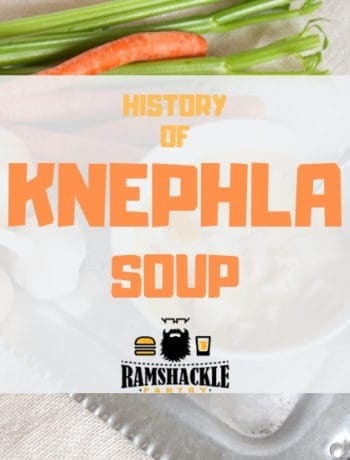 In the course of this series, I have learned that there is much more to knoephla than the awesome soup I know and love. 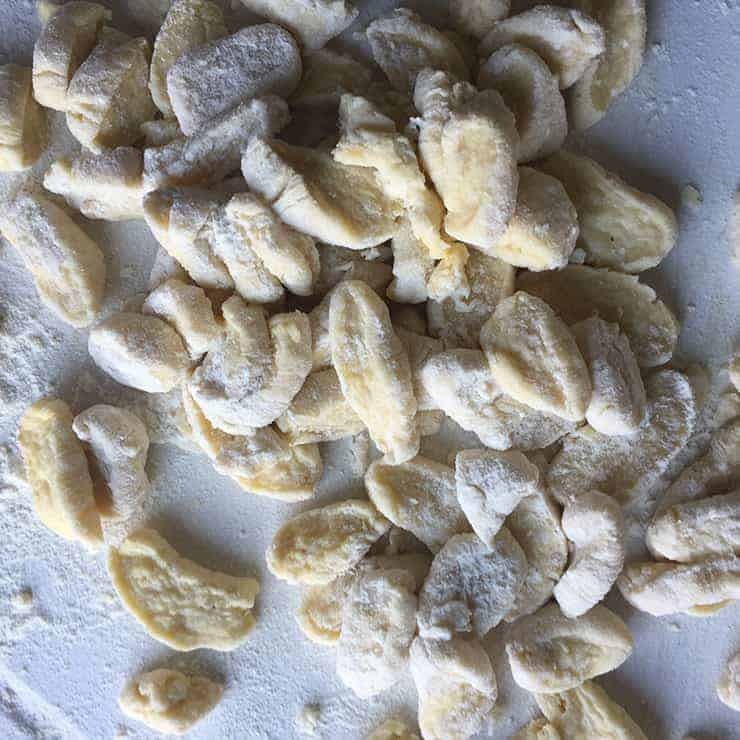 There are many recipes that can be made with knoephla dumplings, and it only makes sense. The dumplings themselves are tasty and can take on the flavor of whatever surrounds them. A nice, creamy skillet dish with dumplings, sauerkraut, and cream is faintly reminiscent of a creamed corned beef recipe that my aunt used to feed me. No, it isn’t Irish, but there is a cabbage element in the sauerkraut and sausage with harkens the flavor of corned beef. Basically, we are taking some of the tasty elements of the soup I know and moving them to a skillet. Then, adding some more traditional German flavors. Oh, and butter. More butter. mmmm. Are the Dumplings the Same As The Ones From Soup? 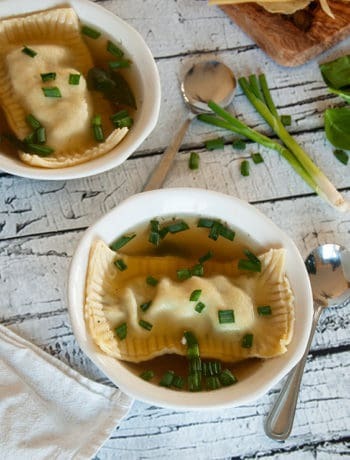 The dumplings in this recipe have the same ingredients from the ones we used in our traditional knoephla recipe, but I did slightly change up how they were cut. I am ok with having some fairly large dumplings in the soup, but it didn’t feel right in this recipe. I cut the dumplings quite a bit smaller to about half an inch. One noticeable difference between the soup and this dish is how we treat the dumplings. Instead of just boiling the dumplings, we are going to fry our dumplings in butter as one of the first steps. We are still going to boil the little dumplings, but then fry them up. The idea here is that we will get some of the little hard fry bits on the outer crust of the dumplings. I think there can be a fine line here between a nice crust and burning. Make sure to mix up your dumplings when they are frying and if it starts to get too brown, perhaps it is time to add the cream. For sure. I would say that almost any cured sausage would be a good substitute for a package labeled as ‘German Smoked Sausage’. Sausage, in general, is pretty awesome and would be good in a kraut, cream, butter, and dumpling mix. Honestly, this was an unexpected delight in this series and I found a new appreciation for both knoephla and for sauerkraut. This is an easy recipe that can be made fairly quickly. Most importantly, it is yummy as hell. 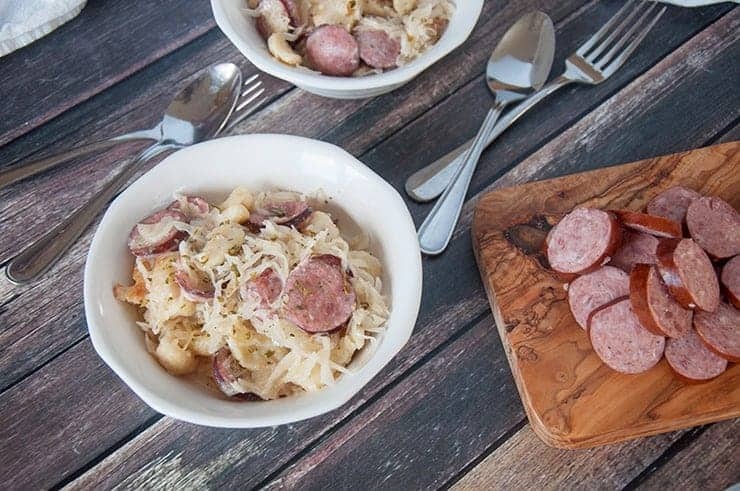 So, eat up aspiring German eater… make this Knoephla Sauerkraut and Sausage Skillet Dish today! 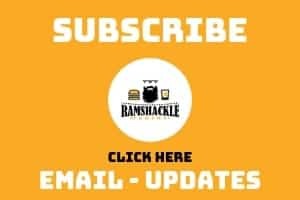 If you like what we are doing here, please subscribe to get updates via email, follow me on Instagram, and follow me on Pinterest. This dish is so German and so tasty. Sauerkraut and sausage are all that we really need to say, but then add in knoephla dumplings, cream, and butter. Heaven in a skillet. So much flavor going on in this dish. cut into 1/2-inch dumpling pieces and set aside. 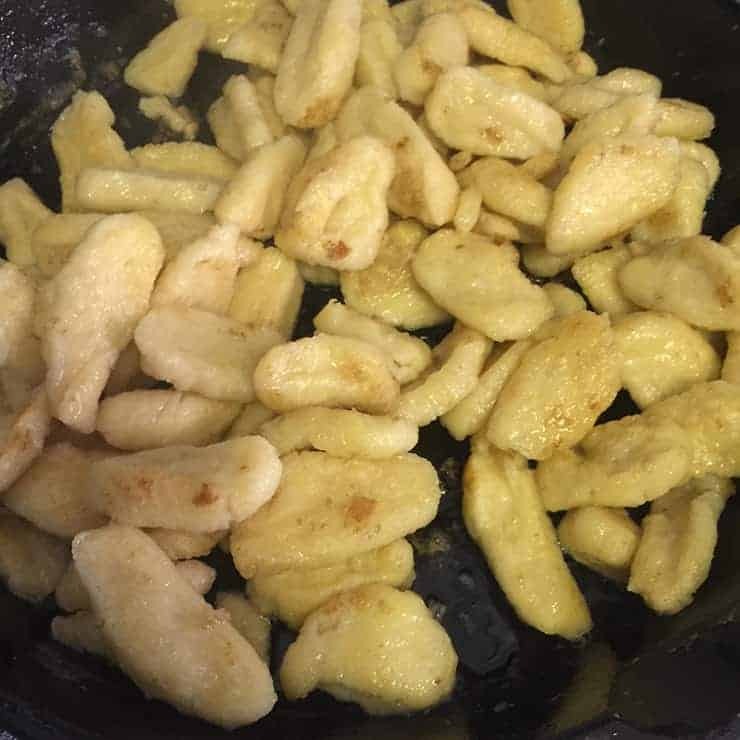 Once butter is melted, add dumplings and fry for about five minutes or until a golden brown crust starts to develop on dumplings. Make sure to mix with a spatula regularly. Add sauerkraut and cook until warmed. Boy, does this sound good. It kind of reminds me of pierogi in the sense that it has fried dough and sauerkraut – two things that I love. And bring on the sausage!